Military veterans had written to President Ram Nath Kovind expressing their outrage at the armed forces being used by political parties for votes. 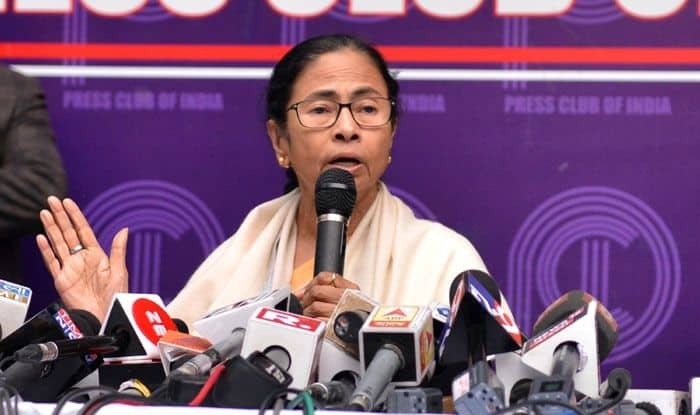 West Bengal Chief Minister Mamata Banerjee on Friday expressed solidarity with army veterans conveying outrage over the alleged use of armed forces for political purposes and asked the BJP leadership not to build their identity riding on the sacrifices and achievements of the soldiers. The Trinamool Congress president said unlike Prime Minister Narendra Modi, she does not ask for votes in the name of the soldiers. Addressing a poll rally in Kurseong for the Darjeeling Lok Sabha constituency, Banerjee claimed that “regional parties have become important, we will together form the government”. The TMC chief had floated the idea of a Federal Front of regional parties on the eve of Parliamentary elections. Banerjee said she was proud of the Army for achieving great feats for the country, and asserted that the name of the soldiers should not be misused. “I will not ask for votes in the name of soldiers like Narendra Modi during elections,” Banerjee said firing a salvo at her rival. “Former service chiefs have appealed that the names of soldiers be not used for political purposes; I am with them,” Banerjee said expressing solidarity with the military veterans, who wrote to the President Ramnath Kovind expressing their outrage over the issue. India’s operation to destroy terrorist camps in Pakistan after Pulwama killing of 40 CRPF jawans is being used as an important narrative in the ongoing election campaign. “Regional parties have become important, we will together form the government,” Banerjee, who is seen keeping distance with the Congress in the opposition camp and demonstrating bonhomie with regional satraps like TDP chief N Chandrababu Naidu and her Delhi counterpart Arvind Kejriwal among others, said. Asserting that BJP will not come back to power at the Centre, she claimed that it will not get seats in many states. She, however, did not name any state where she claimed the saffron party would not win seats. West Bengal has a total of 42 Lok Sabha seats, third highest after Uttar Pradesh’s 80 and Maharashtra 48. “They (BJP) say that they will do NRC in Bengal, but I assure you that I will not allow it in my state,” she added. In a bid to strike a chord with the tea garden workers, who form a large chunk of voters in the hills and Dooars region, Banerjee said she has formed a committee to look into their demands. Claiming that she fulfils what she promises, Banerjee trained her guns on Modi’s 2014 election assurance of transferring Rs 15 lakh into bank accounts of poor people after bringing back black money from foreign shores. “He has not fulfilled the promise, ‘Chowkidar jhuta hain’ (Chowkidar is a liar),” she said taking a swipe at PM. “We can get jobs for the people here only, they don’t have to go outside,” she said. “We do not need to beg, we are making the hill university at Mungpoo”, she said about the educational institution coming up with funds from the West Bengal government. She said that the development of more tourist spots needs to come up in Darjeeling and Kalimpong districts to increase job potential. The BJP has fielded Raju Bista, hailing from Manipur, from Darjeeling seat this time in place of sitting MP SS Ahluwalia. Trinamool Congress (TMC) has given a ticket to Darjeeling MLA Amar Singh Rai.